This is a reflection on now versus then, and which one is better. Recently, my friend Jo and I were catching up and talking about the old times. She and I grew up in the same small town in Iowa and while we have gone our separate ways, when we do connect, it is like we just talked yesterday. She has been my friend since I can remember. When someone knows all about your life, you know they are good friends. For some reason, we were talking about books we were both reading on the Civil War. From that, both of us remembered a story from our Junior High days and were laughing about what would happen now if the same series of events unfolded. I am going to tell the story the old way as best as I can remember and then I’m going to tell it the modern way. What happened then versus what would happen now. You can help decide which were better times. It all starts in Mr. K.’s Social Studies class in 1977. Mr. K. was not necessarily a great teacher. His method of teaching was reading to you from a copy of our Social Studies textbook. There was nothing written on the chalk board, no group discussion, no questions. Just Mr. K. droning on about what happened in the world from the beginning of recorded history to the start of World War II. You see, our textbooks were outdated. Being determined to finish reading the textbook to us before the year ended, Mr. K. ended where the book did, which was the beginning of World War II. It would be much later in our lives before we ever heard stories of nuclear bomb shelters, John F. Kennedy, the Vietnam War or Martin Luther King, Jr. Basically, no knowledge of history from 1943 through 1977 for the Class of ’82. In late Winter/early Spring of 1977, we had reached the Civil War. Mr. K. read as eloquently as he could about what it was like during those days. Many days, the soldiers had little, if anything, to eat. In the darkest of times, they were reduced to frying up a thing called hardtack biscuits. 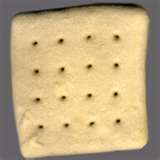 Hardtack biscuits were a mixture of flour, water and salt that were then thrown into some hot oil and fried until golden brown. No peanut butter, no jam on them. Just a small flour biscuit was all these men would eat for days on end. That story did nothing for any of us, except for one classmate, Brian P. In one of the rare times that I can remember in Mr. K.’s class, he actually raised his hand and ask to repeat the hardtack recipe. Brian P. was so intrigued that he rushed home that afternoon to create an authentic Civil War moment for himself. He pulled down his mother’s Fry Daddy, heated the lard inside to the highest temperature that was possible for the Fry Daddy to get to and began to make “at home” hardtack. He mixed a large amount of flour and salt together with water until a very sticky ball was formed in the bowl. He then spooned out six large globs of the mixture and placed them in the hot lard. He was so excited. He knew to fry them until golden. He went to check on his Civil War staple and looked down into the Fry Daddy. At that moment, the hard tack exploded. There were too many air bubbles in the sticky mixture and they released into the grease at the same time poor Brian P. looked into the frying machine. Hot grease rose out of the Fry Daddy like hot molten lava spews out of a volcano. It hit Brian P. hard in the face and hands and created second degree burns all over his little white cherubic face, neck, hands and fingers. He was burnt badly. However, the next day, his mother sent him to school. We knew the next day that something was wrong. We walked into Social Studies and it was not the same. Mr. K. stood in front of us versus sitting at his desk. He did not have the outdated textbook in his hands. He didn’t call each of our names out and take attendance. We were asked to quickly sit down for an important announcement. We all sat down with the exception of Brian P. He was not there. He was absent. Mr. K. proceeded to tell us the sad plight of Brian P. and his adventures in hardtack gone wrong. We were told not to try the art of hardtack frying at home. It was dangerous. It would result in burns. Then he motioned out into the hallway and in walked Brian P. The class gasped and screamed at Brian P.’s bubbled up face. Fried face, swollen eyelids, big lips and what appeared to be a webbed set of fingers. One eyelid appeared to be inside out. He sat down in his seat and said nothing. People who sat near him leaned away. Angie P. in our class asked to be excused as she thought she saw pus on one of his burns and she was going to get sick. No one said a word as Mr. K. began reading about the Civil War as if nothing happened. That was then. Now let me tell you the story if it happened now in modern times. Brian P. took his ear buds out of his ears and was flush with excitement. The DVD he was watching on the school’s iMac was so interesting. 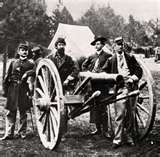 He was the first in his self-paced History class to get to the Civil War. No one else knew or had even heard of hardtack as it was told to him from a long-ago taped Civil War veteran’s narrative who had made the biscuits for his troop. He would go home this afternoon, he decided, and make a batch of “at home” hardtack to bring to his class in the morning in order to receive extra credit. If he aced his History class, the sky was the limit at the number of private high schools where he had applied. He could go anywhere! 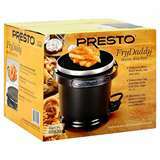 He went home and turned on the deep fat fryer that was part of the stove on the island of his parent’s kitchen. Thank god Mom had wanted a replica of Paula Deen’s kitchen set up, complete with the built-in fryer. Brian P. could hear the organic vegetable oil bubbling as it heated up for his project. He mixed flour, salt and water into a large bowl until a sticky glob appeared. He scooped out six mounds of the sticky mixture with an ice cream scoop his mom used only for cookie making and placed them in the hot oil. He knew to wait until they were golden. He looked over the fryer at the same time the “at home” hardtack exploded in his face. Brain P.’s parents rushed into the kitchen. His mother called 911 and gave a complete and detailed description of what had happened. The ambulance and police were on their way. Brian P.’s parents went to their fully stocked first aid kit and applied burn ointment to his wounds to stop the burning and to reduce pain. Brian P.’s father went with him in the ambulance to the hospital. His mother stayed at the house until Child Protective Services arrived to make sure there were no signs of child abuse or neglect at play here. The other mother’s in the neighborhood would sneer for weeks at Brian P.’s mom asking amongst themselves what kind of mother leaves her child unattended in her Paula Deen kitchen. At the hospital, it was decided that Brian P. should be air lifted to a hospital with more of an advanced burn unit. It was only second degree burns but better safe than sorry. He was placed on an IV of fluids and an antibiotic. His father also called in a favor from a collegue who asked his plastic surgeon friend in town if he could come to the new hospital in case there needed to be any stitches or facial work done. How would Brian P. make it in his life with a scar or glaring spot of red on his face, neck or hands? Brian P. did not return to school until six weeks later. He was up to speed with the class, as his parents hired a tutor that taught him during the day the same lessons the other children were receiving in school. His parents, however, had entered into a trial separation over who was at fault for the incident and the stress involved. The class had already progressed to the Civil Rights Movement of the 1960s. Each student told Brian P. of their interviews with law enforcement about if there was any funny business going on in history class. Mr. K. had returned from his paid leave of absence that was done until further investigation had concluded. Mr. K. was reprimanded, but not fired. The self-paced DVDs were being reviewed by the parent’s association and might be replaced with newer ones based on the results of the Spring school fund raiser. In each story, Brian P. made a full recovery in all respects. He had created a legacy for himself with a story that would be told for generations. The great hardtack scandal would take on a life of its own. As my friend Jo and I finished our look back at Brian P.’s bad luck, we talked about whether it was better then or better now. Jo emailed me later and said how many of our classmates bring up the Brian P. hardtack story and his crispy little face. She said she simply cannot believe, looking back on it, that his mother made him go to school like that. That’s the kind of crap that used to happen. That if it happened today, parents would get jailed. He probably should have been in the hospital. Her final words about Brian P. were that she thought she missed those days. Those days of naïveté and ignorance were bliss. That there was something to be said for all of it back then. It got me to thinking and wondering what times were better and I decided to ask for your opinion. Do you think times were better or worse back in the old times versus how they are now in modern times, especially as it relates to kids? This entry was posted in Life and tagged Acorns, Blog, Family, Food, Humor, Life, Photos. Bookmark the permalink.